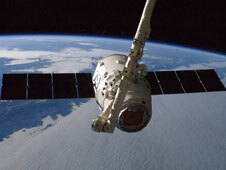 The SpaceX Dragon commercial cargo craft is grappled by the International Space Station's Canadarm2 robotic arm. Image Credit: NASA At Florida’s Cape Canaveral, within sight of the launch locations of every NASA human spaceflight mission to date, SpaceX launches its Falcon 9 rocket and Dragon spacecraft. Founded in 2002, SpaceX has designed these systems from the ground up using the best of modern technology. The Falcon 9, which will launch the Dragon to low-Earth orbit, uses SpaceX-designed Merlin LOX/RP-1 engines, with nine in the first stage and one in the second stage. Dragon is designed to not only take cargo to the ISS, but also bring back cargo and experiment samples to Earth. It is the only cargo craft that can do that. Both SpaceX and Orbital Sciences took part in NASA’s Commercial Orbital Transportation Services (COTS) Program. Under COTS, NASA is helping commercial partners develop and demonstrate their own cargo space transportation capabilities to serve the U.S. Government and other potential customers. The companies lead and direct their own efforts, with NASA providing technical and financial assistance. Launch site Cape Canaveral Air Force Station, Fla.